What Amenity is Right for Your Store? Deciding how to choose an amenity for your retail store can be challenging. On the one hand, retailers are mindful of budget constraints, amenity vendor-brand affinity and other logistical concerns; on the other, the slower the retailer adapts to the new retail landscape and modern consumer’s needs, the more at risk they are of falling behind or – even worse – becoming obsolete. One of the ways retailers can help narrow their choice is by first selecting the intended goal of the amenity. We’ve narrowed down the top goals of in-store amenities into the five biggest ones: delight customers, boost sales, collect data, be an innovator and improve the shopping experience. Skip ahead to the goal that best suits your needs and find out what amenity is right for your store! Retailers are constantly seeking new ways to “surprise and delight” their customers. Amenities like free Wi-Fi, enticing food and drink options (free or paid) and experiences or events are some of the key amenities that have been shown to boost shopper happiness, leaving them with positive memories of their in-store shopping experience. Free Wi-Fi: Wi-Fi is perhaps the most ubiquitous amenity in retail stores today. It’s no surprise that a recent study found that 96% of consumers prefer stores that offer free Wi-Fi. Free Wi-Fi is a huge relief for consumers who don’t have an unlimited data plan and want to stay connected while they shop. With access to free Wi-Fi, consumers can also share positive word of mouth about the brand, tag retailers on social media, and obtain additional product information that will help boost their confidence in their purchase. Food & Drink: One look at the masses huddled around the free samples tables at Costco should be proof enough that people love free food. But even if you’re not offering complimentary food or refreshments to your customers, you can also consider opening a cafe or partnering with an eatery to satisfy your shopper’s cravings and give them a reason to stay longer. 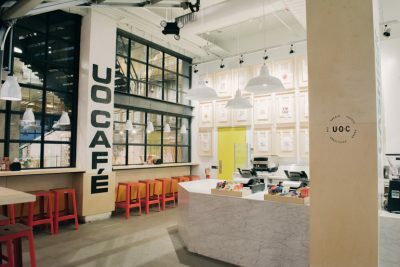 All department stores now have in-store dining establishments and standalone retailers like Brooks Brothers, Club Monaco and Restoration Hardware are embracing the trend too. The right amenities can have a tremendously positive impact on a retailer’s bottom line. While there are many amenities that may indirectly boost sales, amenities that make the shopping experience more convenient – like mobile payments, self check-out and free phone charging kiosks – are the ones that generate the biggest increase in sales. Mobile Payments: Long checkout lines are one of the biggest pain points for shoppers. A recent study found that most consumers are only willing to wait up to 8 minutes in line before abandoning their cart. Furthermore, 77% of consumers said they were less likely to return to a retail store if they experienced long checkout lines. To make the checkout experience easier and faster, retailers are turning to mobile payment systems (mPOS). 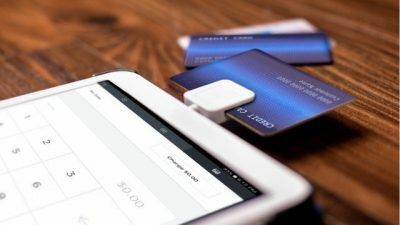 According to a recent survey by IHL Group and Stratix, retailers who deployed mobile POS solutions successfully saw an average of 24% increase in sales in 2017, compared to retailers who don’t offer mobile payment as an option. In addition, retailers with flat or declining growth who launched mobile POS saw a 100% increase in sales in 2017! Free Phone Charging Stations: Back in 2016, we called phone charging stations “the next in-store Wi-Fi,” predicting that most of your favorite stores will offer the service by 2020. It’s now early 2019 and our prediction looks to be coming true! Over 1,000 ChargeItSpot kiosks are now found in almost all major department stores and big box retailers, from Nordstrom to Target. Besides its obvious practical uses (powering up your customers’ phones), charging kiosks have also been proven to boost dwell and sales! According to an independent study by GfK, customers who used a phone charging station while shopping in store stuck around 2.3x longer and spend 1.47x more at the checkout register! Without access to consumer data, it’s hard to judge the success of any new retail initiative. A recent RetailWire white paper revealed that 76% of retailers consider data insights to be critical to their brand’s performance. E-commerce sites may enjoy a natural advantage when it comes to data collection but brick-and-mortar retail is quickly catching on thanks to the implementation of robust loyalty and credit card programs, free in-store Wi-Fi, as well as new retail technology tools like beacons and NFC. Beacons: Major retailers across the US – from Apple to Walmart – have embraced beacon technology as a way to push customized promotions to in-store customers. Beacons push these real-time promos via their app to shoppers who have their Bluetooth connection enabled (and the app open). While beacons, on their own, can only collect location data (eg. what product sections a customer is checking out in the store), when coupled with a mobile app, they have the ability to gather data points ranging from emails, brand affinities, social network influence and demographics. 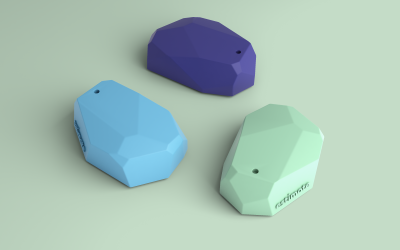 With its low price point and easy installation process, beacons are one of the most widely adopted technologies in the retail industry today. Near-Field Technology (NFC): NFC allows phone and other devices to easily share data with other NFC-equipped devices. Unlike beacon technology, with NFC, a connection is automatically started when two NFC-enabled devices are within four inches of each other. Once in range, the devices can instantly communicate and send prompts to the user. While NFC tech is primarily used as a digital wallet in conjunction with Apple Pay, retailers are also embedding shelf tags, packages and even individual products with NFC chips to relay – and collect – data. That data can be collected and analyzed in order to contextualize customer interactions with the product (where, when and at what time a customer interacted with a product), measure the effectiveness of brand messaging, and make real-time adjustments if needed. What brand doesn’t want to be considered innovative? Innovation in retail often comes in the form of the technology. Retailers that are properly adapting the latest technological advancements like robotics, Augmented Reality and Virtual Reality are enjoying a competitive edge against the more traditional retailers. AR and VR, in particular, help level the playing field with online shopping sites by giving consumers the confidence they need to make purchases. Robotics: There’s no arguing that robots are cool. 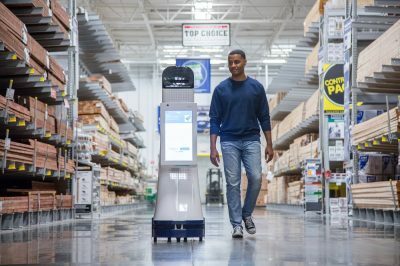 While most of us are familiar with those that perform behind the scenes – packing and assembling our products in warehouses – more and more retailers are bringing their robots to the main floor. Both Target, Giant and Walmart, for example, has deployed robots to move through the aisles and use cameras to identify issues with product labels on shelves. Lowe’s home improvement stores have rolled out a fleet of “Lowebots” in the Bay area, tasked with helping customers locate products and keeping tabs on inventory levels. In Japan, Nestle has deployed over one thousand robots named Pepper at its Nescafe stores to sell coffee pods and machines as well as respond to customer queries. AR/VR: Augmented Reality and Virtual Reality technology are becoming more commonplace in retail stores, with Goldman Sachs forecasting that the market for AR and VR in retail will reach $1.6 billion by 2025! According to a 2016 study, 61% of consumers prefer retailers that offer AR experiences, and 40% of them would pay more for a product if they have the chance to experience it through AR. Cosmetics brand Charlotte Tilbury has installed “magic mirrors” at the beauty counter, scanning images of a shopper’s face and revealing a dozen makeup looks without the customer needing to apply any makeup! Timberland has similarly deployed virtual fitting rooms at select locations. When customers stand in front of the screen, they can see a virtual version of themselves which they can outfit with different items from the store. Luxury apparel brand Karen Millen opened a virtual flagship – modeled after its London store – to allow customers to browse and shop 24/7 thanks to high-res panoramic photography and software adapted from 3D mapping and architecture. In a large global study released earlier this year, 70% of shoppers said that the most appealing retail stores had features that simplified and streamlined the shopping experience. Self Check-Out: To improve the shopping experience, groceries, drugstores and even traditional retailers are installing self service checkouts. According to a recent study, 38% of customers believe self check-out kiosks are the best in-store amenity. Besides reducing wait times, self check-out kiosks also offer shoppers control and privacy. Numerous studies have shown that people generally like to be left alone when shopping in stores. In fact, a field experiment with shoppers at a mass-merchandise store concluded that if a store employee made eye contact, the shopper was 37% less likely to purchase their intended product during that trip! Another survey found that 77% of shoppers said they were more likely to shop at a store that offer self-serve or assisted tablets. The fear of social judgement over buying junk food, hygiene or intimacy products, for example, can really impact a shopper’s decision to purchase those items. Installing self service checkout kiosks can go a long way to helping shoppers make their purchases with ease, speed and comfort. Touchscreens: From wayfinding kiosks to interactive displays, price checking scanners to “magic mirrors,” touchscreens are becoming popular amenities in both big box and independent retail locations. According to a PwC study, a sales associate’s product knowledge is the number one factor for improving the in-store experience. By equipping the sales associates with information-filled touchscreens, they can be ready to properly respond to all customer queries. 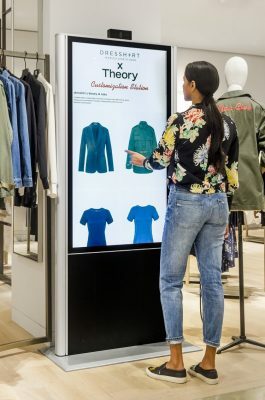 Interactive mirrors are another popular touchscreen-enabled technology that fashion retailers in particular are embracing.